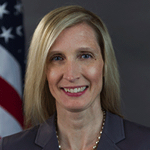 Jane A. Norberg is the Chief of the Office of the Whistleblower in the Division of Enforcement of the U.S. Securities and Exchange Commission. She joined the SEC in January 2012 as Deputy Chief and was promoted to Chief in September 2016. In her capacity as Chief, Ms. Norberg helps administer the whistleblower program including working with whistleblowers and their counsel, reviewing and analyzing whistleblower applications for award, and engaging in public outreach to educate potential whistleblowers and other interested parties about the program. Prior to joining the SEC staff, Ms. Norberg was engaged in private law practice for 14 years, including at Shearman & Sterling LLP.